This Stick-Eastlake residence was originally located three blocks away at 1686-1690 Post Street. Along with its neighbors, it was moved here in 1978 when the San Francisco Redevelopment Agency (SFRA) was bulldozing much of the Western Addition. Jimbo's Bop City operated from 1950 to 1965 in this building when it was still on Post Street. Bop City hosted Miles Davis, Dizzy Gillespie, Charlie Parker, John Coltrane, Ella Fitzgerald, Billie Holiday and many others. Jimbo's Bop City, open between the hours of 2AM and 6AM, fostered the mingling of established musicians and amateurs, as well as a tolerance of social racial integration that was progressive for its time. Its closure in 1965 was a result of changes in the music scene and in the surrounding neighborhood, which was devastated both residentially and economically by the actions of the SFRA. Marcus Books moved into this building in 1980 after all of its previous locations were demolished by the SFRA. Julian and Raye Richardson had established Success Printing Co. in 1947. Renamed Marcus Books in 1960, it was a space of Black community collectivity, empowerment and action. Changes on the local, national, and global scale throughout the 1960s and 1970s were experienced, addressed, adjusted to, discussed, and in many cases rejected from within the walls of this bookstore. 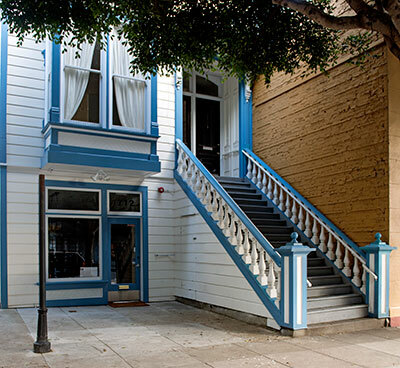 Marcus Books was a haven for Black intellectualism in San Francisco. Marcus Books was evicted from this building in 2014. At that time, it was the nation's oldest continuously operating Black-owned and Black-themed bookstore. Before World War II, this was a Japanese-American neighborhood. In 1942, when Japanese-Americans were sent to internment camps, the neighborhood became predominantly African-American.